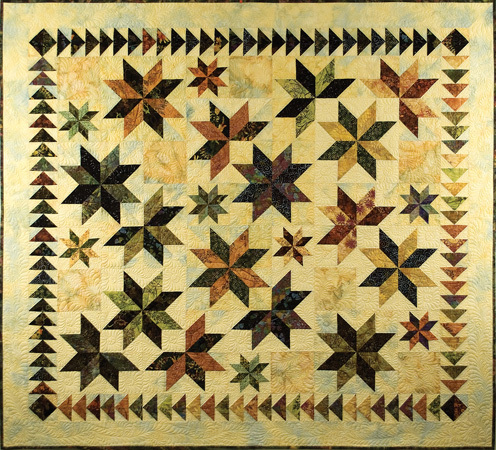 Judy and Brad Niemeyer designed the Meandering Stars as a simple, beginner level, foundation paper piecing pattern. A collection of fabrics designed by Hoffman California Fabrics were used to make both quilt samples on the cover. Memorial To Jan Bressler Another great job Dilly. You need to think about one for you next time! Proud to know that we started you on your Judy Niemeyer addiction. Meandering Stars, Quiltworx.com, Made by CI Nancy Strath. Meandering Stars, Quiltworx.com, Made by CS The Cozy Quilter. Meandering Stars, Quiltworx.com, Made by CS Batiks Galore. 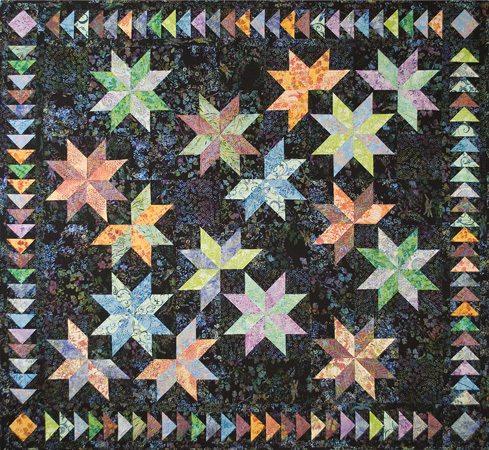 Meandering Stars, Quiltworx.com, Made by Patsy Carpenter. Barb Mathews Sanders Gorgeous! Must add to my "some day" file!! Mona Bearskin I admire the talent of a person who could create something so beautiful and original! Diane Dryden Hey Sue! This is beautiful....let me know when you get to Osseo again...I will run up to see you...Great job! Joanna Holyfield Wimberley How much do you sell this for. I just love all these quilts. Yvonne Parent Porter Don't you just love the black background on that quilt? MERRY CHRISTMAS to you from me!! Shirley Peterson Dietrich The black background really makes the colors pop. Very pretty. Sorry, there are no classes scheduled for Meandering Stars Basic - DISCONTINUED at this time.